This is a sequel to a very popular online slot by Barcrest, belonging to the ‘Irish legends’ genre. It features five reels and four rows in its basic playing area, along with up to 200 paylines and an RTP of 94%-97.5%, depending on how you choose to play it. The ‘Drops of Gold’ bonus, along with the Big Bet and Gamble features, keep things interesting. Maximum jackpot is a big 1000x your initial stake. The best place to play the game is here with us at UK Slot Games, where you can also play over 600 slot games, including ‘Starburst’, ‘Rainbow Riches’, ‘Fluffy Favourites’ and ‘Bonanza’. What can we say about the Rainbow Riches family of games that hasn’t already been said? Unless you’re very new to the world of online slots, chances are you’ve heard of the Rainbow Riches series already. You may even have played some of the games, especially the widely-loved original. 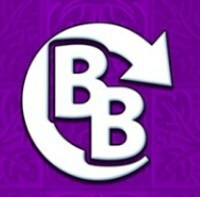 Such is the popularity of Rainbow Riches that developers Barcrest have released a whole family of games, using the same theme and the same characters, all of them with a unique twist that makes them fun to play in their own right. Just in case you’ve never played a Rainbow Riches game before, here’s the basic information: They’re all set within a beautiful and bright world of Irish legends. That means lucky leprechauns, pots of gold at the end of the rainbow, jaunty Irish music that you could dance a jig to, and pretty much every stereotypical symbol of Ireland you could possibly imagine. Rainbow Riches: Drops of Gold marks itself out as different from the other games in the series as soon as you load it up and look at the reels. The 5x4 layout of the base game is nothing unusual, but above that is a separate set of reels, all of which are carrying golden and silver pots of gold down from a rainbow towards the regular reels. They have a specific function when it comes to the game’s bonus features, and we’ll get to that in a moment. Aside from that, the lush green Irish hills roll away into the background. They make for pleasant scenery, but don’t distract you from your main focus, which is those reels and the symbols they contain! Speaking of the symbols, the lower values are made up of the traditional playing cards. They run from 10 through to A. The more valuable basic symbols are comprised of a horseshoe, a harp, a fiddle (presumably belonging to our leprechaun friend! ), some mushrooms and the game’s logo. Everything has a cute, cartoonish feel to it, which gives the game a friendly atmosphere. That’s typical of the series, and one of the reasons so many people love it so much. Now things get a little more complicated! The gold and silver pots that come down from the rainbow are the game’s wilds. The silver one will replace everything other than the bonus symbol to create winning lines. The gold one will replace absolutely anything, including the bonus symbol, and is therefore even more valuable. The bonus symbol itself combines all those stereotypes together; it’s a pot of gold at the end of a rainbow! The wilds and the bonus symbol have implications for the game’s bonus features, so let’s have a more in-depth look at them, and how they work. Almost all the Rainbow Riches games are known for their unique and innovative bonus features. Barcrest go out of their way to make sure each new Rainbow Riches game has something original about it to distinguish it from the other games within the family, and they’ve done it again with Drops of Gold. 1. 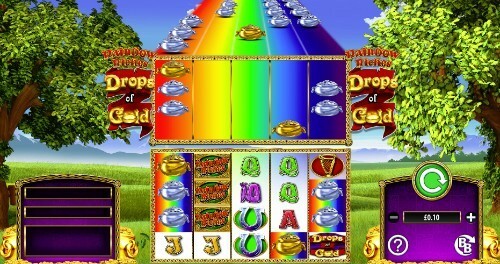 Drop of Gold: Drops of Gold is the bonus feature which gives the game its name, and also involves those pots of gold that are spinning around below the rainbow. Any time a ‘Drops of Gold’ wild appears on the fifth reel, all of the gold and silver pots on the bottom row of the rainbow ill fall from the sky and re-appear in the equivalent position on your reels, replacing whichever symbols are already there. All of them act as wilds, and so if there are plenty of symbols in that bottom row when the mode is triggered, the wins can be substantial. 2. Free Spins: Free Spins are available too, which is a nice touch. When a game already has a generous bonus feature, some developers prefer to leave it at that. Barcrest have decided to spoil their players with even more incentives! Land three of the pots of gold (either silver or gold) anywhere on the reels, and the free spins feature will be triggered. You get eight three spins for landing three of the symbols, plus another four for any additional ones. More free spins can be triggered the same way during your free spins, meaning the feature can continue indefinitely. 3. Big Bets: Big Bets are a common feature in many of the later Rainbow Riches games. They might only appeal to high-rollers, because they have to be bought and paid for. A £20 Big Bet means the Drops of Gold symbol on the fifth reel doubles in height, covering two rows, and additional pots of gold are added to the rainbow. That should mean more of them fall out of you trigger the bonus. A £30 Big Bet does exactly the same as the £20 Big Bet, but goes a step further. All of the lower value symbols are removed from the reels, meaning any winning lines you find are worth more. A £50 Big Bet is strictly reserved for those who have the budget and tolerance for it, but in return for the bet you get exactly the same as the £30 Big Bet, as well as the number of paylines in the base game increasing to 100, and 200 in the Free Spins round. Obviously, this gives you the best possible chance of finding wins and triggering further bonus features. By this point, ‘Barcrest’ just exists as a brand name. They were long since bought out by SG Gaming, who own and operate all the Barcrest titles, and still use the name occasionally when they’re launching games with the traditional market in mind. The history of Barcrest can be traced all the way back to 1968. Over the course of the decade that followed, they arguably established themselves as the biggest physical slot games manufacturer in Europe, supplying bars and casinos across the UK and the continent. When times changed, and it became clear that the future of slot gaming was online, Barcrest changed with the times and struck gold with the launch of the original Rainbow Riches back in 2006. Five years later, they were acquired by the Scientific Games Corporation, who are now more commonly known as SG Gaming, and could be more accurately described as a union between Barcrest and another gaming firm called The Global Draw. Many of the strategy and design staff from Barcrest were kept on, meaning the same talent pool could be called upon to make new games. The fact that the description is so short tells you a lot about SG’s confidence in the game. Rainbow Riches is an absolutely legendary series of slot games. They know that every time the release a new game into the family, there’s already an audience there waiting to play it without anybody needing to sell it to them. Drops of Gold is a very recent addition to the family, having launched in June 2018, and it’s absolutely worthy of the Rainbow Riches name. It’s just one more triumph in a series that’s been full of them! The slot game world is absolutely full of games that are based around Irish folklore. Many of the stereotypes of Ireland are associated with luck, and that makes them a natural choice when developers are considering themes for their latest online slot. So long as slot games have existed, so have games with an Irish theme. As we’ve already said, Rainbow Riches: Drops of Gold is a sequel to the 2006 original and joins a huge family of existing Rainbow Riches games, all of which were developed by Barcrest and/or SG Gaming, and all of which have their own unique set of features. Meet the rest of the family! The game that started it all is one of the few online slots that’s lasted from almost the dawn of the concept. Most titles that were released more than ten years ago have seen their appeal fade as time has gone on, but Rainbow Riches isn’t like most slots. It was light years ahead of its time in terms of its bonus rounds; particularly the ‘Road to Riches’ bonus which still appears in most of the sequels. With an RTP of 95%, 20 paylines and a charm that’s defied the years, the original is still definitely well worth a look. Rainbow Riches Pick ‘n’ Mix slot was the first sequel to the original game, and was released in 2016. Nobody ever accused the original game of being short on bonus features, but this one adds even more to the selection. You can’t play them all at once; you select three from five before the game starts. The original three are all still there, but added to them is a free spins bonus (which was lacking in the first game), a ‘Magic Toadstool’ bonus which is a standard ‘pick a prize’ game, and a ‘Cash Crop’ game triggered by finding three of those leprechauns again. Again, this involves winning prizes based on the values of coins that then appear on screen. There’s also a ‘Big Bet’ feature which invites players who are happy to bet a little extra to speculate and accumulate on three extra wheels. With Big Bet mode enabled the RTP is 98%, whereas the regular game offers 96%. This game has even more bonus features and quirks than Drops of Gold. For some players, it might even be a little too much. Rainbow Riches Leapin’ Leprechauns isn’t, strictly speaking, a slot game at all. It’s closer to a video game which you can win money from, using the look, feel and characters of the Rainbow Riches world to appeal to existing Rainbow Riches players. Each bet gives you five jumps; you can think of them as spins; which allow your on-screen leprechaun to move from one platform to the next, collecting rewards as he goes and trying to avoid objects which will end the game. It’s like an old-school platform game with money on the line. There were no sequels to the original Rainbow Riches for ten years, and then three appeared in 2016! Slots of Gold was one of them. This variation of the game offers 100 paylines, split over two sets of five reels, which makes for a packed-out playing area. A staggering seven separate bonus features are on offer, along with the Big Bet feature that first appeared in Rainbow Riches Pick ‘n’ Mix. As well as looking out for a leprechaun, you’ll also want to attract the attention of a purple fairy, who can offer you multipliers, free spins, or the changing of standard symbols into wilds. Those are some useful magic powers when it comes to trying to find a win! This game probably belongs somewhere between Pick n’ Mix and Drops of Gold in terms of features and complexity. If Pick N Mix made the Rainbow Riches series more complicated than it used to be, this 2017 sequel looks to make them simple again. Rainbow Riches Free Spins offers exactly what it sounds like it should offer; a heavy focus on free spins. In fact, in this version of the game, they’re the only bonus feature the game offers at all! You’re awarded more and more free spins depending on how many of the free spin bonus symbols you can find, and extra bonuses found during those free spins add to your tally, up to a maximum of 999 free spins. You should be able to find a few wins if you max that out! There are only ten paylines, but with fewer symbols and so many spins they should be easy enough to find. This feels very stripped back compared to the other games. For some people, the bonuses are the charm of the series, and this game takes them away. This was a 2018 offering in the Rainbow Riches series, and definitely looks to take the game back to basics. It’s best described as a modernising of the original game, with the Big Bet feature added on, and the graphics brought into the modern era. The magic fairy from Slots of Gold is the central bonus feature here alongside the Big Bet; she’ll transform into a random symbol to boost your chances of a win. This time, the Big Bet offers bonuses of £10-£50 depending on what symbols you have on screen when it’s activated, and your stake. As always, it boosts the RTP up to 98%. It will probably appeal more to fans of the original than fans of Drops of Gold. This is the newest member of the Rainbow Riches family, which arrived in late 2018. With this title, Rainbow Riches finally moves away from five reels and three rows into a five-by-five game, offering up fifty paylines and a maximum bet of £500 per spin. Above the reels are wooden doors full of wilds; find a leprechaun on row one and he’ll open up one of those doors for you, pouring the wilds onto your reels. Free Spins and Big Bet are back again as standard components of the game, with an RTP of 94% up to 97.75% depending upon your stake and the bonus features. This is a cross between Drops of Gold and Fortune Favours. Before we get into this, we’ll say it’s very doubtful that anybody will ever outdo Barcrest or SG Gaming when it comes to the Irish genre. The Rainbow Riches series is the best known and the most well established. More importantly than that, it’s also the most popular. That’s not to say other developers haven’t enjoyed some success with their own take on the genre though, and here are some of the best of them. There are actually two different online slots named ‘Irish Luck’, but the better known one is probably the Eyecon offering. It uses much of the same imagery as Rainbow Riches, but throws in a few pints of beer onto the symbols just to add to the Irish stereotypes it’s already dealing with! There’s even a fairy who can bless the reels and alter the symbols, which will be very familiar to Rainbow Riches fans. With its five reel format and rainbow background, this looks very, very similar to Rainbow Riches. But then if something isn’t broken, why fix it? Pragmatic Play are a major force within the gaming industry, and they’re certainly not going to let Rainbow Riches go unchallenged! Leprechaun Song slot is a smooth, slick and colourful online slot, taking all the window dressing of the early Rainbow Riches games, but adding better quality animation and a jaunty Irish soundtrack. There are some innovative bonus modes available to keep the game interesting, and an RTP of 96.46% is never to be sniffed at. We honestly couldn’t say whether this is better than any of the Rainbow Riches games. Why not try both and find out? NextGen aren’t going to be left out of the Irish legends genre, either. This is another pretty game which takes on the Irish theme, and also adds some beautiful women to the reels to keep the male players interested. We don’t know if it does the same thing for the women. Pots of gold are what you want to see on the reels; so if you’ve played a Rainbow Riches game you already know what you’re doing here. The bonus modes are free spins, and a gamble feature that enables you to wager the total of your previous winnings. The RTP is a decent 95.04%, but it just doesn’t have the depth of features that attract so many people to the Rainbow Riches franchise. Rainbow Riches: Drops of Gold was released in 2018. You would expect that to mean it was developed with mobile players in mind, and that it will play just as flawlessly on a hand-held device as it does on a computer. Drops of Gold has a unique problem, though. Given that the wild symbols in the rainbow always have to be visible on top of the reels, it requires a large play area in order to function properly. Therefore the mobile version of the game can only be played in portrait mode, and even then it feels like a bit of a squeeze; the ‘spin’ button creeps across the right of the reels, disappearing again after it’s been pressed. SG Gaming haven’t tried to create a version of the game that would work in portrait mode, and we don’t blame them. We can’t see how it could be done without compressing the screen so much that it becomes unplayable. We won’t lie; the mobile version of this game does feel slightly crowded on your screen, and you’ll need to use precision when you’re playing it. It’s still completely playable once you’ve got used to it though. Sometimes, a little awkwardness is the price you pay for originality. We could never hold that against the developer; we love it when they try something new. By now, you should already know that anything ‘Rainbow Riches’ related is big news within the gaming industry. The latest releases always generate coverage, and people are eager to talk about them and review them. CasinoBeats, a website that covers all the latest news within the industry, got excited when the game was released. They noted that it was one of four potentially huge releases by SG Gaming during the same time period, but reserved special praise for Rainbow Riches. They were impressed by the way that the Drops of Gold bonus round works, and noted that it was already performing very well both online and at retail. By the end of 2018, the website Gamespace believed the game still deserved more attention than it was getting. They noted that a lot of time was put into the development of the game, and that it was good enough to be nominated for a prestigious ‘game of the year’ award, but worried that other games in the Rainbow Riches series were still getting more love and attention from players. That’s not a bad thing from the point of view of the developers; so long as those players are playing any version of Rainbow Riches, we’re sure they’re happy! 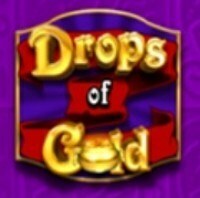 Why Is UK Slot Games The Best Place To Play Rainbow Riches: Drops of Gold? 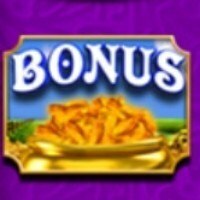 We love the Rainbow Riches series; that’s why we host so many of them at ukslotgames.com. We know how popular they are with players, and recognise the legendary status of the games. If you love the series just as much, and you’re ready to give this version of it a play, then we’d love you to stay right here and play it with us. Secondly, we don’t force you to deposit money when you first sign up. Everybody is welcome to make an account, and you can then browse our entire catalog to find a game you really want to play before you hand over any money. The Rainbow Riches series is a fine place to start, but there’s no reason to stop there! In fact, we do the opposite of forcing you to hand over money. When you sign up, you could win up to 500 free spins on our games just for doing so!